Socializing in the Tenderloin District, 1900s. 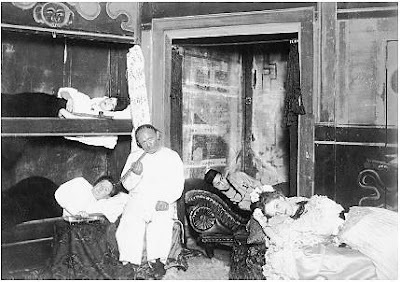 At dawn they spilled onto the narrow sidewalk outside an opium den. It was the winter of 1908. 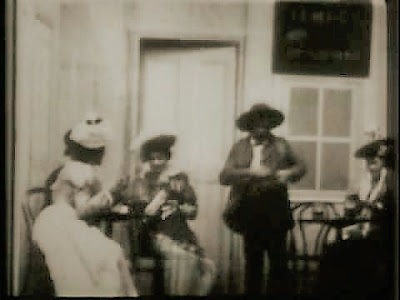 The three women and their younger male companions had begun the evening carousing in Manhattan’s Tenderloin district, a treacherous neighborhood filled with thieves and slummers drawn like moths to saloons, brothels, and gambling parlors. Now, as the clock struck 5:30, drunk and stoned out of their heads, they staggered along Bayard Street in Chinatown, clinging to each other and veering away from the alleys where hooligans lurked. They made their way toward the elevated train, heading uptown. No one was looking out for anyone else. The women were Annie Conning, who worked as a maid at the Chelsea Hotel, Rose McGuire, and Mabel Cuzzie. The three men would remain unidentified. 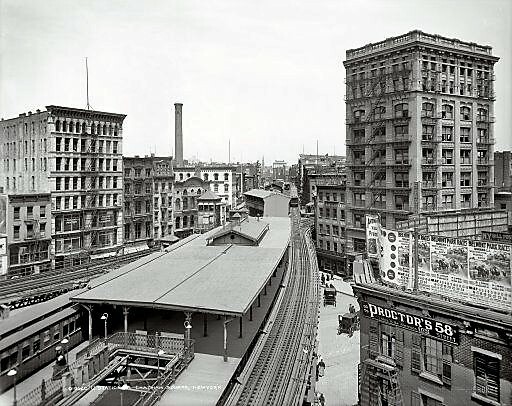 Convergence of elevated lines, Chatham Square, 1900s. Once on the train, they passed around an open bottle of champagne while yelling, laughing and taunting the other passengers, who were laborers trying to grab some sleep on the way to work. One of the group, a man who sported a gray coat, dozed off. While he was sleeping, the others took his watch, chain and tie pin. When he awoke and realized his watch was gone, he leaped toward Mabel and grabbed at the muff she wore on her hands. Then a gun went off and Annie, who had risen from her seat, dropped dead on the floor, shot through the heart. A pistol fell from the muff. The man in the gray coat picked it up, slipped it into his pocket, and swiftly left the train with the other two men. Mabel had met Queenie and the man in the gray coat, whose name was Ed, the previous night in a bar on 26th Street. The next day, the denizens of the Tenderloin flocked downtown to the morgue. Queenie’s employer, Mrs. Callahan of the Chelsea Hotel, identified Annie Conning and explained that she came from a wealthy Delaware family and had a husband out there somewhere. 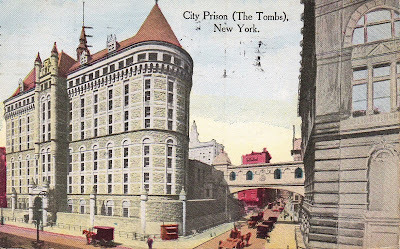 The police detained Rose McGuire and sent Mabel Cuzzie to the Tombs, Manhattan’s notoriously grim prison. 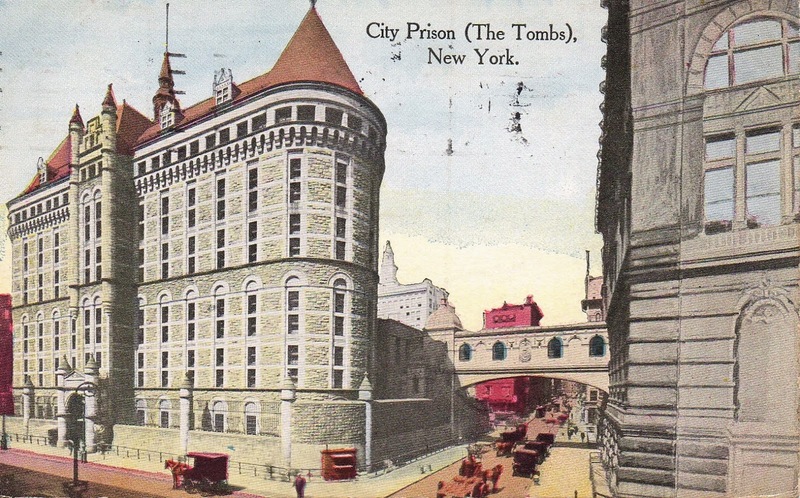 Postcard of the horrible Tombs, 1900s. A letter carrier named Samuel Lipschitz who had been a passenger on the train and observed the “antics of the party” (in the words of the police) swore that the killing was unintentional. Still, while the inquest may have vindicated both women, Rose and Mabel paid a price whereas the three men just disappeared into the workday. It’s not surprising that the group of six began their evening in the Tenderloin. Nothing good could ever come of it. *The diarist George Templeton Strong called the Tenderloin a “noctivagous strumpetocracy.” It’s an odd phrase, evocative of Spiro Agnew’s “nattering nabobs of negativism,” which means night-walking (noctivagous) prostitutes (strumpets) in control of the government. I left the New York of this era so much.